Thank you for your blog. I was prescribed O2 in early November and it’s been such an adjustment for me and my family. I also have limited mobility and that doesn’t help. Your blog has made me feel better about myself and this whole new way of living. Thank you. Also, when I first got my O2 my kids and husband all tried my cannula to see. It’s best if they know what I’m getting to deal with. Thanks again. Glad to see you made it through the storm. How are the folks on oxygen faring down there? Blood gas drawing HATE HATE IT, But, one of the RTs took it from the brachial artery, doesn’t hurt at all. Felt like a regular blood test. Still looking for my own liquid oxygen equipment so that I can get rid of my.supplier who will not fill my 20 liter as long as I keep it in the car. Every week my wife and I drive into.Boston to get it filled. I pay coin of the Realm for it. $28.50 per week, but worth it as I can get out and do stuff. I use the whole tank for outside work. Do your know what he sent me for a week ok portable oxygen 2c and 2d. Yeah, that won’t even last a day. What a nebish. He and his company know nothing about oxygen. One good thing we finally cleared out the cellar. 1 1/3 truck loads later we can actually see the dirt floor. Inherited the house from my parents, so still have lots of stuff to go through. My wife let me go into the basement with a mask on for the first time in 7years. (Before I get the oxygen, and we had just gotten married ). Sorry it took me this long to respond to your comment. K and I went on vacation to celebrate my 48th birthday and our 25th wedding anniversary! Yay! It was 10 whole days of fun. And then we got home and I crashed to recover. You know, I’m actually starting to not dread ABGs (blood gas labs) because I guess I’ve gotten some REALLY great RTs who know how to use a needle! Do you have a looooooong oxygen tubing that you can hook up to your oxygen concentrator to string out the door into your yard? Our yard is really small. I can connect 2 7feet tubing to my 50 feet of tubing to making 67 feet of oxygen tubing to reach outside to my shed in the backyard. My o2 concentrator is near the back door. Congratulations on getting into the basement! I definitely would have used a mask too. I can NOT handle dust very well. Outside I use my liquid oxygen companion. Now to do the rest of the house with downsizing. PFT on Monday, then see a PAH specialist in Boston for a second opinion. Good luck with your Pulmonary Functions Test! Have you had a right heart cath yet to diagnose you with PAH? My niece had a similar experience when she stayed with us over the labor day weekend. She is 8 and was very curious about using oxygen. She asked alot of questions and was really interested. 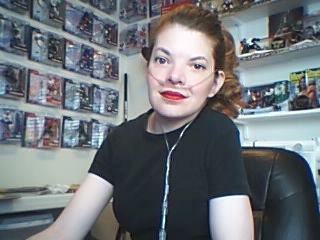 She eventually asked if she could try it so I got a cannula for her and attached it to a partially full oxygen tank. I at first had the regulator set at 2 liters on the pulse setting but she didn’t like it so I put it on continuous flow which worked better. She tried it for a while and when I assumed she was getting bored and started taking the cannula off her she asked if she could keep it on. She told me the oxygen helped her breathe. I turned the oxygen back on and she wore her cannula until the tank ran out. Hi! Thank you for your comment! I bet your niece is a lot of fun. I don’t like pulse flow either. Maybe your niece was a little tired and with the oxygen she felt a little more alert?? =o) Kids are so funny. You might be right, that morning she was rushed around getting ready to stay with us. That and the excitement of staying over where she could practically get away with murder probably wore her out. She was alot of fun and her mom has had her stay over weekends more often. Each time she has shyly asked if she could wear “tubes in her nose” and have some oxygen. I guess she’s still curious. You are right, kids are funny.